All posts in "Jesus’ Difficult Words"
Will Angels Preach the Gospel Worldwide Before the End? Jesus said, “This good news of the kingdom shall be proclaimed in all the world as a witness to all nations and then the end shall come” (Mt 24:14). But Revelation 14:6 says that an angel has the “everlasting gospel to preach to the world.” So who exactly preaches the good news, a prophet or an angel? And most importantly of all, what is this good news of the kingdom, anyway? It’s not what you think! When is the Great Tribulation Not Coming? 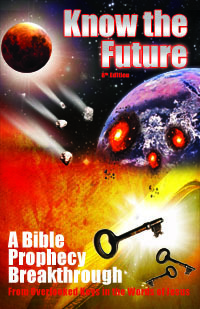 Can we know when the Great Tribulation will be? Or at least when it won’t be? Mark Biltz thinks so and I agree with him, except for his reckoning of the Sabbath year. Learn what the Great Tribulation is and how to tell when it is not near. Jesus’ disciples asked him the very question that every Christian still wonders today: how do we know when you’re coming back? Amazingly, Jesus answered by giving the actual “signs of his coming and the end of the age.” He didn’t refuse! We can read his straightforward answer in Matthew, Mark and Luke. Yet Christians don’t understand his answer as evidenced by how they fall for every speculative counterfeit end time sign theory hatched by Christian prophecy theorists in its place. Find out what you’ve been missing in Jesus’ answer so you understand the real signs of his coming and never have to fall for another false prophecy theory again. Jesus gave the “Parable of the Fig Tree” in his answer to his disciples’ question on the sign of his coming yet Christians don’t understand the sign it refers to and instead keep inventing new ‘signs’ almost every year. The parable itself is often turned into a symbolic prophecy referring to major events in the history of modern Israel one “generation” away from Christ’s return, supposedly allowing you to calculate the second coming date. But does “this generation” refer to Jesus’ first century audience or maybe to our generation, the “last generation?” Discover the real meaning of the parable and the key to discerning where we are in Bible prophecy that it plainly teaches when you let it.